Before you decide to put in a patio, you have to consider a few things. The next thing to think about is the goal of the patio. Is it meant to host family events, entertain all your guests, or function as a quiet relaxing place? Below is the ultimate guide to creating your dream patio. 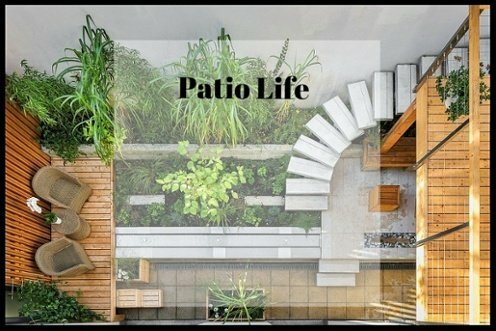 However, if you're building a patio as a way to increase the value of your home, Natalie Washburn, broker/owner of Maleno Real Estate explained, "Any outdoor space, whether it's patios or pools, will not always increase the value of the home. But, it will add more appeal to a home for a buyer, especially for the outdoor people." No matter what the desired function of your patio is, there are a few staples that you must consider. The first being Citronella products, these essentials are good for keeping away bugs who may decide they like your space as much as you do. The next step is durable furniture. No matter the theme, or area you live in, durability is a must. From the materials you select and their finish, to the fabric of the pillows and cushions are made of, durability should be the ultimate deciding factor. By choosing durable products, you ensure that your patio's great look will last several seasons. The last consideration is a patio heater. Whether you choose a fire pit or a space heater, having that heating element allows you to enjoy your patio into the later months and on chillier summer nights. If your patio is going to be used as a family space, there are plenty of ways to personalize your space. Things to consider when picking your patio's look is the age of your family, if you have a family with young children, consider avoiding sharp corners or easily broken furniture such as glass items. When choosing your gathering area, consider a table that can function as a dining area. Add a personalized touch with a game space. Consider family favorites such as customized corn hole, an area for large Jenga, or your very own mini bowling lane. Eradicate dull, ordinary gathering spaces and pull in everyone with creative seating. Rocking and hanging seating is sure to draw in the whole family. Lastly, be sure to provide a place for shade--consider incorporating a large umbrella. If your patio is meant to impress and entertain, decide whether it will feature a dining space, or if you merely want a creative place to gather. Consider making your creative, entertaining space under a cabana. With so many options and designs, cabanas are one way to impress your guests. Incorporate speakers. Whether you choose to hide the speakers or creatively incorporate them into your decor being able to play music in your outdoor space is a great way to entertain (just be sure they are protected from the elements). Elevate your area by including an ice chest that isn’t just a cooler, but adds functionality and pizzazz to the theme of your space. Is your space meant as a getaway for relaxation? If so choose a theme that calms you. Incorporate greens or a water feature to create a relaxing atmosphere. If you're a music person, consider installing outdoor speakers to play pleasing music,. Invest in comfortable furniture such as a hammock or other hanging/ rocking furniture.